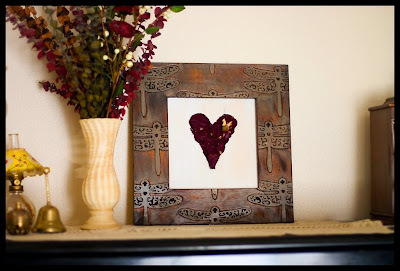 This week I'm sharing the way I carved my frame and made the flower heart. I promised I would in this post, and here it is. I'm responsible like that. Prepare your frame. 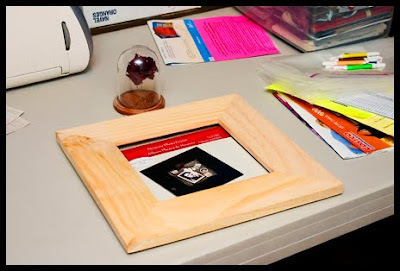 You can use a frame that is already finished if it doesn't have beveling and is solid wood. If you're using an unfinished frame, like I did, make sure it's dry and clean. 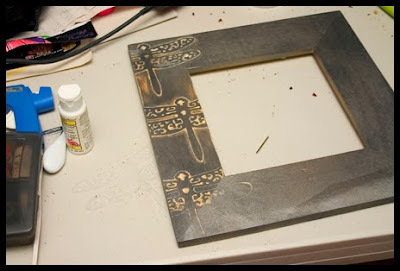 Coat your frame with paint and let dry. I used a metallic spray paint, but basically any stain or paint world work. If you want a more even and less distressed look, you can even skip this step. Let dry thoroughly. Figure out the pattern you're going to carve on your frame. 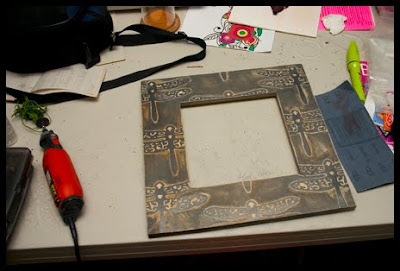 You might want to make a paper template of your frame and trace your stencil to experiment with placement. A word of advice: it can be a pain to do a complicated pattern, so you might want to limit yourself to an accent on one corner or side. My pattern took hours to carve and I was pretty annoyed by the end, and I like complicated projects. Of course, I was doing this the week after my cruise and suffering from a cold and vertigo, which shortened my attention span. Normally, I like detailed and complicated projects, but not when I can't breathe and I'm caught on a never ending carousel, whose horses have been eating speed or crack with their daily oats. 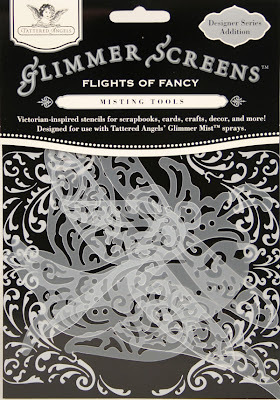 I cannot even tell you how much I love these Flights of Fancy screens from Tattered Angels. This is the first time I've used mine, and I adore them. Those birds would have been so amazing too. 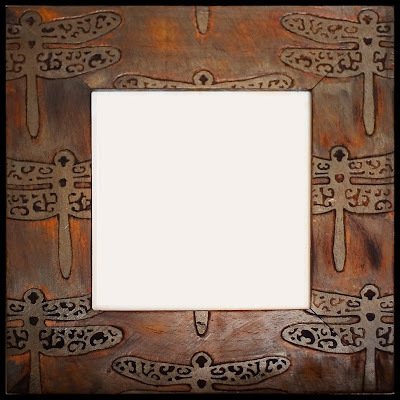 Trace your template lightly with a pencil onto your frame. Using a rotary tool, slowly carve out your pattern. I started using my Provo Craft Chizzle It! (which I really like for certain scrapbooking techniques) but it wasn't really powerful enough for a job like this, so I borrowed David's rotary tool, which worked well. He had a carving bit, but I also tried just about every one in his kit, for fun. You don't need to be perfect. We're going for distressed, not perfection. 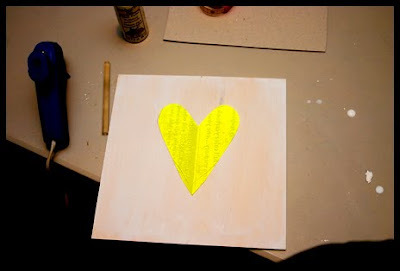 Use regular sand paper to rub the paint off the edges and from between repeats of your pattern or wherever it needs it. Keep distressing until you like the look. 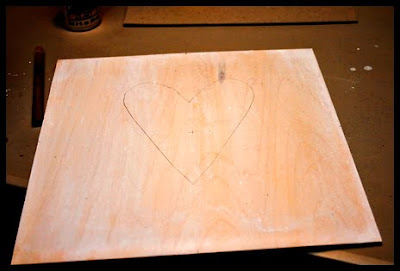 Rub stain into the grooves you carved. I used a cherry stain, but I thought it was a bit red, so I did a coat of dark walnut stain after the first dried. Sand with very fine sandpaper between coats. Let dry. I used the back insert from my frame, which was a thin piece of wood. I watered down some white acrylic paint and whitewashed the board (doesn't show up at all in the picture). You can use a piece of mat board and not use paint. Let it dry. I also wrote a brief description on the back of the insert, because I didn't want to the story to get lost. I think it would have been pretty awesome to print out the story I told in my blog entry on Monday and decoupage it to the back. Of course, that didn't occur to me until just this second. It is important to document things. I have a beautiful metal tray from my great-grandma that will end up in the wall of my kitchen at some point and on the back it has a strip of masking tape that says she made it. I might not have ever known. There were a lot of things it would have been so neat to know the story behind--for instance, I have some old wooden blocks from her as well, but that's all I know about them. It would be so cool to know who played with them and how long they have been in the family. If you can discreetly attach the story to the object, all the better, if not, a scrapbook page or a journal entry would be fabulous too. Make a heart template from a piece of paper by folding it in half and cut it out. Place it and trace around it, lightly with a pencil. Slowly peel the outside petals off the flower, leaving the center intact. Set aside. 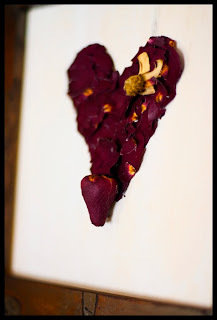 Then, using very small dots of hot glue (or other adhesive), adhere the petals on, with the outside of the petals lining up with the outside of the heart and covering up the pencil lines. Once you have the edge where you want it to be, gently press down the parts of the petal still sticking up. 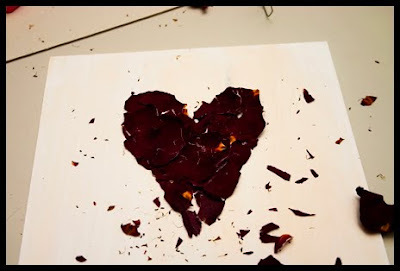 This will break your petal, but we are going to keep layering them until the inside of the heart is filled. 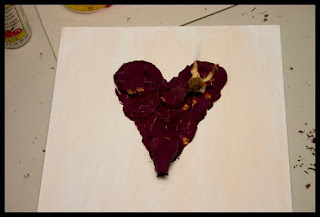 You could leave the petals cracked looking, which I was very tempted to do, but ultimately decided against it. Leave the bottom of the heart undone. Try the center of the flower, tip down, to see if you have enough coverage. Once you do, glue it down. Gently lift and brush off the petal "crumbs." Put a light coat of sealer over the whole thing. Pop it into your frame and proudly display. Helena--it's actually in one of the pictures. It's basically like a smaller, easier to hold drill that you can put different types of bits in. It's great for small sanding jobs or grinding and of course, carving. You did a great job. I LOVE the frame! I have got to try this... I have just the frame ... little scared of the tool; but looks easy enough to do. Wow - that is just amazing! Thanks for linking up to the Weekend Wrap Up Party! You know I love this! What a gerat idea to do with flowers, I won't throw them away anymore, and of course the Tattered Angels and carving, awesome!